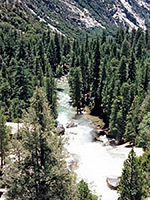 Several paths leave from the east end of the scenic drive in Kings Canyon National Park, 5.5 miles from Cedar Grove; most popular is the 4 mile (one-way) hike to Mist Falls, a short series of cascades where the south fork of the Kings River drops 100 feet over a steep, rocky, granite incline. The route gains 800 feet in elevation, mostly towards the end, and the round trip takes around 3 hours. Mist Falls Trail topographic map, Cedar Grove location map. For the first two miles, the well used path is quite level and not very close to the river, passing instead through a small patch of woodland then across pleasant, open meadows filled by many wildflowers in spring, before becoming quite shaded and crossing a damp, tree-lined marshy area with plenty of mosquitoes. Here the main canyon bends by 90° and runs due north, as a smaller stream (Bubbs Creek) joins from the east, flowing down a much steeper canyon; a branch of the trail follows this into higher, more remote areas in the Kings Canyon backcountry. This junction is 2.6 miles from the trailhead. The final section of the path to Mist Falls stays close to the river, is less shaded by trees, and crosses ground that is steeper and more rocky. The river flows across various other small cascades and rapids, between which are deep, clear pools that look inviting but swimming is not advisable due to the fast current and cold water. The main falls are indeed misty, and support a large area of mosses and greenery for a few hundred yards downstream. 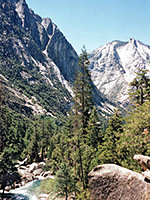 The trail continues, becoming quite steep for a while as it climbs past the falls; immediately above are many large flat granite boulders close to the water, which make ideal places to rest and admire the view down the canyon - of the fast-moving creek flowing down a deep, forested canyon, backed by towering mountains of sheer granite, worn smooth by countless years of heavy snowfall and glaciation. Beyond the waterfall the canyon soon flattens out into a section known as Paradise Valley, which has many good places to camp. Eventually the path meets the Pacific Crest Trail, after a total distance of 18 miles.